Classic Hollywood Westerns aren't known for their nuanced portrayals of racial diversity or gender equality. Some may reject or satirize anti-Native American/anti-Mexican representations, but, on those rare occasions it's attempted at all, it's usually accomplished through the perspective of a sympathetic white male protagonist, or one who has a change of heart. High Noon (1952) is in many ways a film that challenges Hollywood Western norms, from the age of its protagonist to his desire for marriage from the film's outset to his failed attempts to gather a posse in a town that claims to value his efforts but will not risk their lives to support them. (There is also a popular reading of the film as an allegory of blacklisting and the horrors of HUAC.) 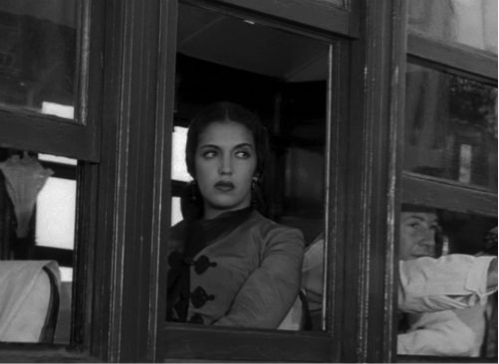 It is arguably most challenging, however, for its inclusion of the complex character of Mrs. Helen Ramirez (Katy Jurado). Ramirez stands out from the glaring whiteness of the film—there are no "Indians" and the only Mexicans we see don't seem to be allowed into the town's establishments. She also stands out from the other images of (white) femininity in the film, especially the Marshal's Quaker bride Amy Fowler (Grace Kelly), who multiplies her whiteness by wearing her spotless white bridal dress throughout the film. While Amy proves to have some gumption in the end and defends her man despite her pacifist beliefs, she only chooses to act after she gets a lecture from Helen Ramirez. The film concentrates on dark vs. light to contrast Amy and Helen, offering both gender and race implications. We see the virgin/whore dichotomy in the juxtaposition of dark-haired, dark-eyed, dark clothed, sexually experienced Helen vs. pale, blonde and blue-eyed, white-clad virgin Amy. Helen was formerly the girlfriend of Frank Miller (Ian McDonald), the villain who was put behind bars by Marshal Will Kane (Gary Cooper) and now returns with his brothers to kill Will and take over the town. She was also the lover of Will himself. 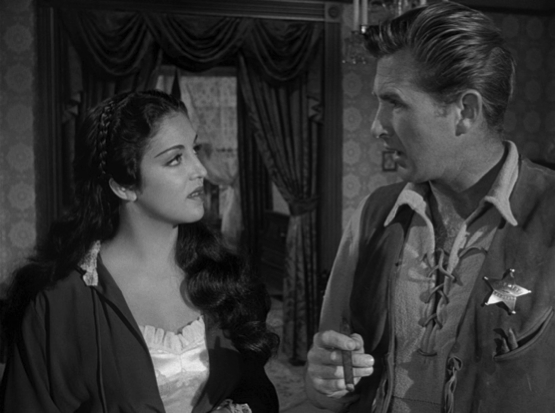 And as the film begins she has taken up with Will's young deputy, Harvey Pell (Lloyd Bridges), suggesting the stereotype of the highly sexualized Latina. Soon, however, and for the rest of the film, we are encouraged to question the sexism and racism in the initial judgment to which we are led. We learn, for example, that Helen is "Mrs. Ramirez," a widow before she took up with Frank and a significant benefactor of the town. Her surname name appears on several establishments that help the town to flourish and she is a silent partner to local white businessmen. We also learn that she is the one who dumped Will when she realized he did not truly love her, not the other way around. And she dumps his deputy when he acts possessive and childish. Harvey has been using her as a way to get even with Will, who did not choose Harvey as the next marshal when he stepped down from his job upon marriage to Amy. If Helen was also playing games by taking up with Harvey, we see her claim her self-respect when she throws him out, and then again when she leaves town, recognizing fully that Will is not and will never be her man and that she, as a widow and Mexican woman in the white, male-dominated West must fend for herself. Perhaps the best moment in Jurado's compelling portrayal of this nuanced character is when she welcomes Amy (who has left Will because he plans to fight Frank Miller) into her room. There is no competition from Helen's side; she gave Will up before he met Amy. And we know too much at this point in the narrative to accept this as the meeting of white feminine purity vs. racialized corruption. Amy is frightened, and it is Helen who advises her to stand by Will, despite her Quaker pacifism. It may not seem a progressive, feminist message in general terms, but it is a powerful one within the context of the film. 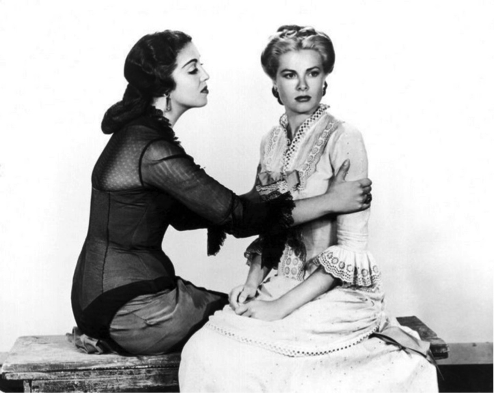 If not friendship, there is honesty and sincerity in this atypical scene between strong women within the context of the Hollywood Western. After this scene, Helen boards the train out of town (and out of the film). We see that as a woman of color in the wild white West, this is her only real option. She has existed at the fringes of society, and this may be her fate for the rest of her life. Her role and her actions inspire the viewer to think: about gender, about race, and about Westerns.